48° 11′ 18″ N lat. : 22° 44′ 09″ E long. 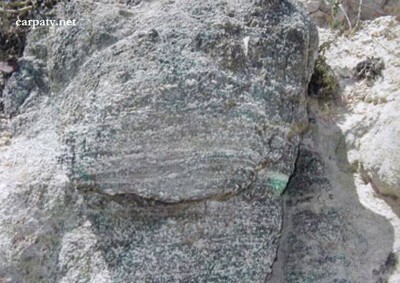 Close to the villages Muzhievo and Dobrosillya (Bene) on the mountain slopes there are located two quarries, maximum bench height more than 30 m. Quarries produce important mineral commodity — perlite that occur at the bottom and top of rhyolite lava flows (Early Sarmatian, absolute age 12.8 Ma). 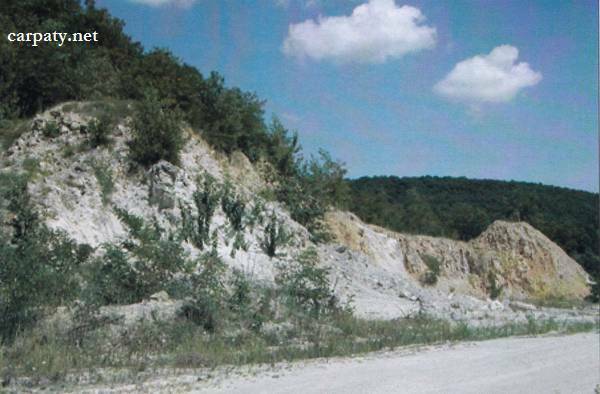 Northern part of old quarry and southern part of the new one is crossed by large latitudinal tectonic fault expressed in extensive rock breaking and secondary alteration (limonitization, kaolinization, opalization) and can be fairly seen in the quarry walls. This fault is called “Perlite Fault”; it is traced over 35 km and control location of most gold-polymetallic occurrences and deposits which are presently known in Biganske, Beregivske and Kvasivske ore fields of Beregivskyi ore camp. Accessible by motor-car. 2.1 km by the road to Perlite Plant (east outskirt of Muzhievo village) then 0.8 km to the east.